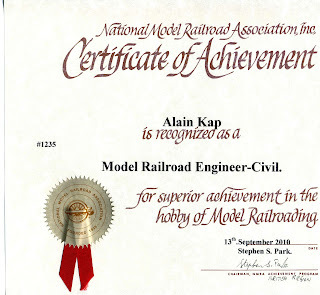 "An NMRA member qualifies as a Master Model Railroader when he or she has obtained at least seven of the eleven Achievement Certificates provided that he or she has earned at least one Achievement Certificate in each of the four areas of the Regulations. 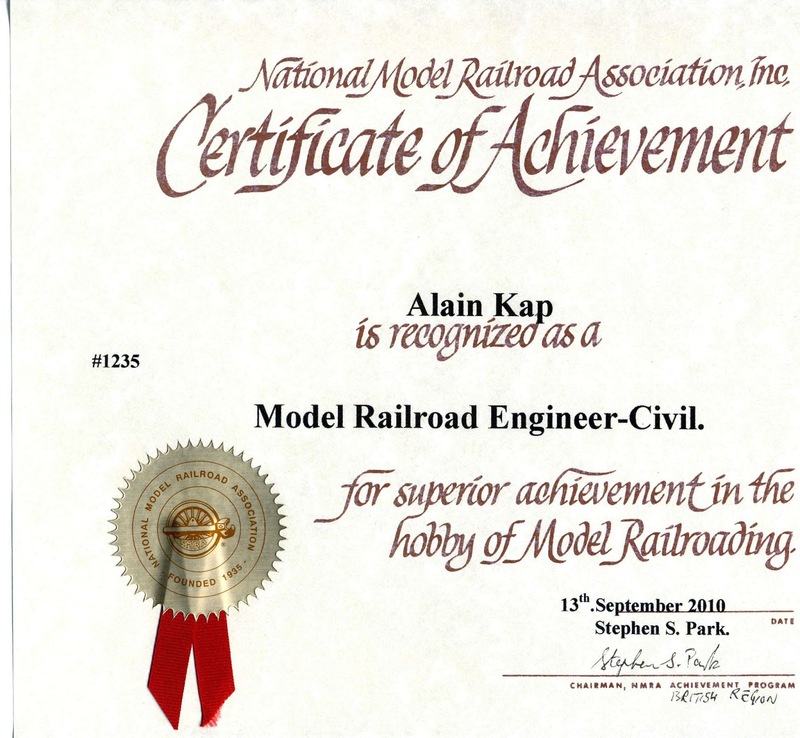 Earning the title of Master Model Railroader is the ultimate goal for many participants in the Achievement Program." The requirements for Model Railroad Engineer - Civil may look long and complicated, but they really are not. The reason that they are so long is to offer you more options for meeting the requirements. Remember - don't read more into the requirements than is there. 1. Prepare one original scale drawing of a model railroad track plan, identifying overall size, scale, track elevations, curve radii, and turnout sizes. You should also consider the requirements for Model Railroad Engineer - Electrical, and Chief Dispatcher when planning your layout - it is much easier to include the requirements in the planning stage than to go back and add them later. 6. Provision for simultaneous operation of at least two mainline trains in either direction. 2. Construct and demonstrate, the satisfactory operation of a completed section of the model railroad and track work described in #1. Containing at least 25 linear feet in Z, N, or TT scale, or 50 linear feet in HO or S scale, or seventy five linear feet in O scale, or 100 linear feet in G or #1 scale, or other scales in proportional relationship to HO scale, with appropriate ballast, drainage facilities, and roadbed profile, which may contain spurs, yards, etc. Commercial frogs are not permitted to be used in any of these items. These models may be built and demonstrated as part of the layout or separately. I had a bag of switch ties left, so I needed to shorten the ties with my NWSL chopper. Then I pressed a strip of scotch tape on the ties and lifted them out of the jig. I pressed the strip ties into a bed of white glue applied on a piece of plywood. Before laying track I ballasted the ties. This leaves no loose ballast on top of the ties. I started with the outside rails until they touched at the frog. NMRA standards gauge and some Micro Engineering track gauges come in very handy to build and check handlaid track. The diamond is the trickiest part. To avoid shorts, I had to cut many gaps. The best way is to solder the guard rails to the outside rails and then cut the caps. Spikes alone cannot hold everything together reliably. This is the centerpiece of my gauntlet track. The jig for spacing the ties. The ties for the turnout. 4. You must win a Merit Award (at least 87.5 points) with the items in section 3 above. 1. Description of the track work features, methods of construction and identification of commercial components used in Section 3. 3. Witness Certification showing that each of the above models meets all applicable NMRA standards. To start I constructed a tie spacing jig to lay out the ties in an even spacing. Then I’ve cut the ties to their appropriate length using a NWSL Chopper. I placed the ties in the template. Then I glued a strip of Scotch Tape on top of the ties to lift the whole length out of the template. When the glue had set I ballasted the ties using a mix of Woodland Scenics Grey Blend Ballast. When the ballast was evenly spread between the ties I soaked the roadbed with a mix of distilled water and 70% isopropyl alcohol. Then I applied a 7:1 mix of matte medium and distilled water and also added a few drops of isopropyl alcohol. When the roadbed had completely dried overnight I started to lay the rails following a construction article from Tony Koester published in Model Railroader and in the Kalmbach book “Trackside and Line side Details”. I nailed every piece of rail down with track spikes on both sides on every tie. I used individual rails from PECO and nailed the rails to every tie from both sides. I did the same for the guard rails. The turnouts and crossings are built following prototype practices from the construction article. I ballasted the ties prior to nailing the rails. By this way there is no ballast on the ties or stuck to the sides of the rails. Every piece of rail is nailed on both sides and on every tie. Nothing is glued. I soldered the switch rod to the points of the closure rails and the point of the frog. The guard and wing rails were also soldered to the rails to give them more strength. The different pieces of track work have to be wired differently. The turnout was wired at the point of the switch. The frog was polarized with one wire and connected to an SPDT switch to feed it with the correct polarity. The gauntlet track was wired according to the following drawing,with the 2 rails between the frogs connected to an SPDT switch to route the correct polarity. Gauntlet tracks can only be travelled by one train at a time, while the other train is waiting in a siding. The 2 tracks between the frogs may be positive or negative depending on which track will be used. The crossing was isolated by cutting the four tracks in the diamond and connecting it to a DPDT switch to route the correct polarities as per the following drawing. Finally I weathered the rails using Floquil weathering sticks. I’ve scratch built all the track work, using individual rail length, stained and unstained ties and spikes. The frogs are soldered and the switch rod is soldered to a PC-board tie. I also used commercial rail joiners and insulating joiners.